From the left, Jamie Apa, Grace Thayer, Jasmine Harrison, Kyle Marshall, Marsha Drabenstadt and Sandra Sterchi, in the main lobby of Akron Children’s Hospital. 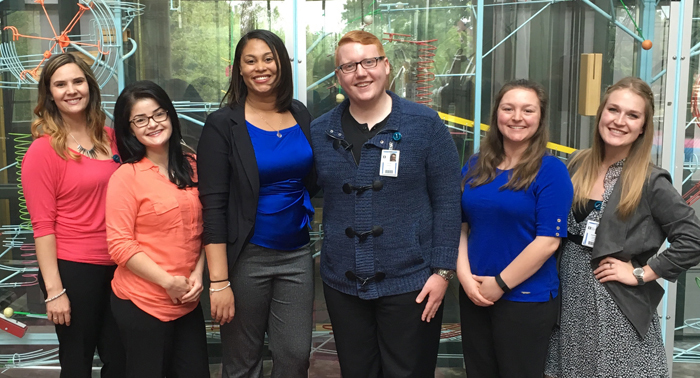 Six Youngstown State University nursing students are working as full-time interns at Akron Children’s Hospital this summer as part of the Assuring Success with a Commitment to Enhance Nurse Diversity program. ASCEND focuses on recruiting traditionally underrepresented groups in the nursing profession. Development of the program began two years ago as a way to increase diversity in the registered nursing workforce at Akron Children’s Hospital. YSU senior nursing students participating in the intern program are Jamie Apa of Brookfield, Ohio; Marsha Drabenstadt of Struthers, Ohio; Jasmine Harrison of Youngstown, Ohio; Kyle Marshall of Canfield, Ohio; Sandra Sterchi of Girard, Ohio; and Grace Thayer of Campbell, Ohio. The 10-week internship includes a $5,000 stipend. The students work with mentors on a pediatric unit: two students in pediatric intensive care and neonatal intensive care/special care nurseries at the Akron Children’s main campus and four students in the pediatric emergency department, special care nurseries and inpatient units at the Mahoning Valley campus. The program provides professional development opportunities and the potential for future employment in a pediatric hospital setting. Experiences include hands-on nurse related activities using case studies and scenario simulation. Students are expected to work three, 12-hour shifts and also participate in a 4-hour professional day every week with topics focusing on professionalism, priority setting, exploring the nurse roles in pediatric health, communication skills, teamwork, delegation, family centered care delivery model, cultural competence, interview skills and resume development.